It’s very hard to have a civil conversation about asylum seekers in Australia. It’s a very polarising topic. On one side we have people who are appalled by our treatment of asylum seekers who are being accused of wanting open borders. On the other side we have people who believe in orderly process and that people should come to Australia with proper visas and documentation. For these people the prevention of boats arriving in Northern Australia is imperative at all costs and so they are accused of wanting cruelty in offshore detention as part of the solution to stop the boats. It seems so black and white, but surely there has to be some grey space. Today here at CEFA, we’re going to try and stay out of the politics of this subject and stick to the constitutional facts and the rule of law implications. The debate about this topic is so difficult that we struggled to decide on the best way to present this important constitutional issue. One thing this topic highlights is the intolerance that Australians have of the views of others when it comes to asylum seekers. In the media the opposing sides yell each other down about how wrong they are. However, polling has shown no majority of support for either side. Last year’s Lowy Poll found that people rated the Government’s ‘handling of the arrival of asylum seekers by boat’ at 4.9/10. That’s a pretty average result. But the cries from some very loud voices on the polarised ends of the debate makes finding a policy solution for people seeking asylum in Australia very difficult. So how do we get some decency back in the conversation? What we have been shown this week, by the Supreme Court in PNG, is that there are limits to Government power. Their Court this week declared the detention of asylum seekers and refugees on Manus Island is unconstitutional. The Constitution of Papua New Guinea has a Bill of Rights, which precludes detaining people that have not broken a law in that country. This independent exercise of judicial power exists both under the PNG and the Australian Constitution and is essential to the maintenance of the rule of law in constitutional democracies. This judicial decision has created a problem for our Government. Let’s start by having a look at the history of the rights of people not to be detained if they haven’t broken a law. Last year was the 800th anniversary of the Magna Carta which was the precursor to constitutions like ours and PNG’s. The Magna Carta was created in 1215 because King John had been acting like a despot. Among other things, he was locking people up without trial, and the English aristocracy wanted to put a limit on the powers of the King. No free man shall be taken or imprisoned or dispossessed, or outlawed, or banished, or in any way destroyed, nor will we go upon him, nor send upon him, except by the legal judgment of his peers or by the law of the land. The Magna Carta and the Common Law that was shaped from this, evolved over many centuries to create a more democratic England with strong rule of law principles. Much of Australia’s common law originates from England. Including the principle that a person cannot be detained without being judged to have committed a crime. You might now be asking – how is it that we can detain asylum seekers here in Australia then? And I’m sure you’ve heard someone talk about ‘illegal boat people’. In the past few years we have had confusing messaging about “illegal boat people” arriving in Australia. However it is not illegal for a person fleeing persecution to seek asylum in Australia or any other country that has signed the refugee convention. The unlawful part is the actual boat arriving in Australia without the correct authority (hence why the people smugglers are given a trial here in Australia). The people on the boats (and those who fly here) have a right to seek asylum under international law and to not be penalised for their mode of entry. But by describing the asylum seekers as illegal the topic becomes confused and Australian people feel more at ease about sending these people to places like Manus Island (and Nauru). This is a good opportunity to examine why it’s quite lawful to seek asylum. Before World War II many persecuted people fled Germany but were sent back by the countries to which they had escaped. Thousands of these returned people were subsequently killed during the war. After the end of the war and once the horrors were realised, it was determined that people fleeing persecution should be able to seek asylum in other countries. The refugee convention was designed after this period to ensure no country ever turned its back again on vulnerable groups who need to escape persecution. Australia ratified the convention in 1954 and since that period we have resettled some 800,000 refugees. You’ll see a couple of emphasised words above – imposing penalties. Do you think detaining asylum seekers is a penalty for arriving here without the correct authority? Our Constitution does not contain a comparable section to the Constitution of PNG outlining that people cannot be detained without having committed a crime. The writers of our Constitution believed that common law would sufficiently protect human rights such as this. In practice what this means is that asylum seekers can only be detained while their claims for asylum are being processed. We cannot just lock people up and throw away the key. Offshore detention solved a problem for Australian Governments as the High Court of Australia has no jurisdiction in other countries. People in Australian detention must be processed, whereas in these offshore detention facilities we can make people wait longer and try to prevent them settling in Australia. But this solution is crumbling at the moment. In anticipation of the recent High Court judgement about detention on Nauru that centre was changed to become an open facility and now the Supreme Court in PNG has ruled that the Manus Island detention centre is illegal. As this is a very fraught political issue, where the major parties seem to reluctant to back down, we probably won’t see much happen soon. The Immigration Minister and the Prime Minister have both stated that the refugees and asylum seekers being held on Manus Island will not come to Australia. The emphasis seems to be upon Papua New Guinea to find a constitutional way to house these people. There are many problems associated with this including that the detention centre is in the middle of a naval base, meaning that can’t just fling the gates open (like they did on Nauru). 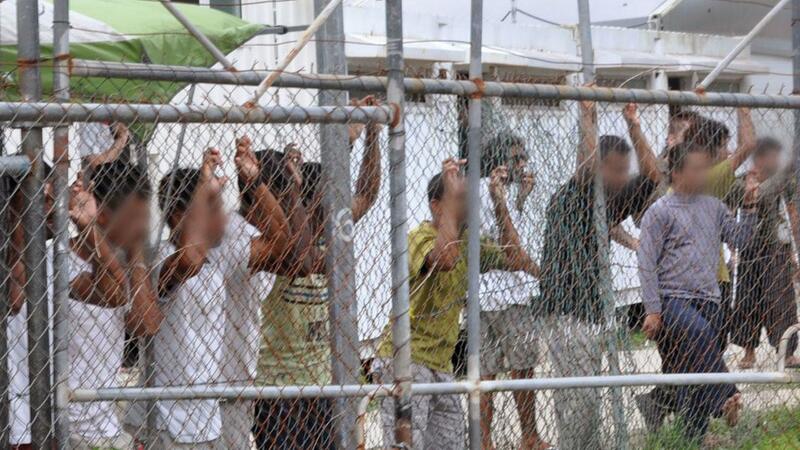 Could Australia just wipe their hands of the asylum seekers on Manus Island? The 850 people under the MOU [memorandum of understanding] are the responsibility of the PNG government. However Gillian Triggs from the Australian Human Rights Commission has stated that PNG could launch an international lawsuit at the International Court of Justice in The Hague to force Australia to take back the people from Manus Island. At the moment there is a stand-off. But it not likely to be a long term solution. Could there be a better, more lasting solution? After the Vietnam War many thousands of people fled on boats. The victors of the war were persecuting the people (and their families) that had fought with the Americans during the war. A few boats had begun to arrive in Darwin, which the Prime Minister Malcolm Fraser was concerned about. He then helped to create a regional solution. Australia worked with the UN and other countries to create holding centres for the 50,000 people that were fleeing Vietnam each month. There were several processing centres throughout South East Asia where people could travel to and then seek asylum in Australia or other countries. In total, the Fraser Government resettled some 70,000 Vietnamese refugees. Perhaps we could look at something like this again?